illustration from choiceshirts. who knew? And now, with all the tech tools and online reporting from camp and enewsletters from school and such, it seems we have more to do than ever. I don’t know if all the technology in our lives has given us more work as moms or if it has streamlined our lives. I think both, actually. You think an iPhone can do a lot of things? Maybe it can. 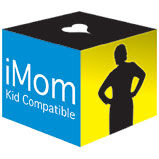 But if you really want to get something done, use that iPhone and call an iMom. < I love new technology.